Knowing how to avoid mosquito bites in Asia is essential. Not only are the itchy bites dreadfully annoying, dengue fever — a mosquito-borne sickness — is a real problem throughout Asia, particularly in Southeast Asia. Although your chances of contracting something serious such as malaria are relatively low, even small mosquito bites can quickly become infected in humid and dirty environments. Try not to scratch! Although travelers concerned about safety in Asia probably worry more about poisonous snakes and ill-tempered animals such as monkeys, the real threat comes from a much smaller, often-unseen creature: the mosquito. With their capability to transmit dengue, Zika, malaria, yellow fever, Chikungunya, West Nile, and Japanese encephalitis, the World Health Organization has determined mosquitoes to be the deadliest creatures on earth. Snakebite claims an estimated 11,000 victims per year in India, the most affected country. Meanwhile, malaria killed an estimated 438,000 people worldwide in 2015. Millions more died from other mosquito-borne illnesses. Mosquitoes aren't just a problem for humans: they transmit heartworm to animals as well. Although dengue fever is typically survivable, a case will put you under the weather for a month or longer — not something you want to deal with. Learning how to avoid mosquito bites will lower the chances that you come home with an unwanted souvenir in your bloodstream. Only female mosquitoes bite when they want to reproduce, otherwise they prefer flower nectar. The males also survive on flower nectar and don't take blood meals. Humans typically aren't a mosquito's first choice for food. Some species prefer to bite only birds. Studies show that mosquitoes generally prefer to bite men rather than women. Pregnant women are more often bitten because of their increased carbon dioxide output. Overweight people are at a greater risk for mosquito bites. Mosquitoes can smell carbon dioxide emitted from your body from over 75 feet away. 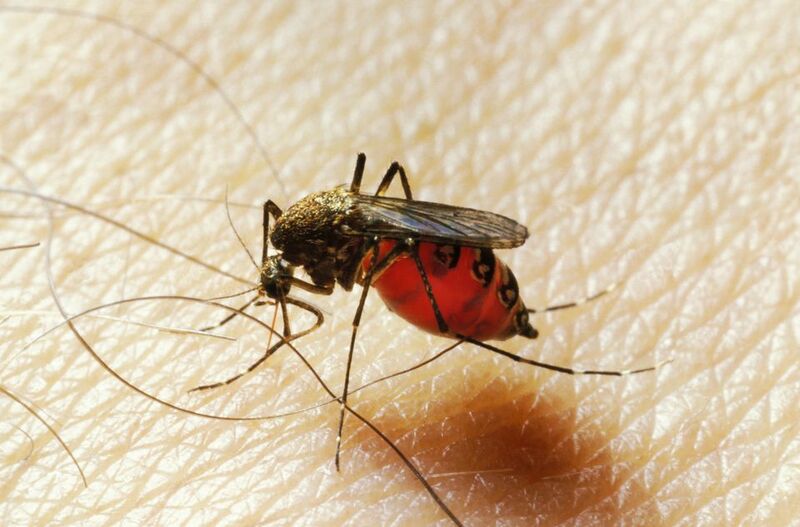 Daytime mosquitoes (Aedes aegypti) are more likely to carry dengue fever, while nighttime mosquitoes (Anopheles gambiae) carry malaria. The average lifespan of a dengue-carrying Aedes aegypti mosquito is only from two to four weeks. A 2013 study concluded that mosquitoes bite people with type "O" blood 83 percent more often. Genetics can account for 85 percent of the reason mosquitoes may prefer you instead of another nearby victim. Mosquitoes can smell lactic acid in sweat and are drawn to bite. The key to avoiding mosquito-borne threats such as dengue and malaria is to not get bitten in the first place! Covering up as much as possible, although inconvenient in hot climates, is the easiest and safest strategy. The low-energy mosquitoes in Southeast Asia often remain close to the ground; they tend to bite ankles and legs under tables where they go unnoticed. Always use repellent on at least your legs and feet before going for dinner. Mosquitoes are supposedly attracted to brightly colored clothing. Stick to earth tones or khaki clothing when trekking in Southeast Asia. When possible, cover exposed skin rather than spray it with chemicals. Mosquitoes can bite through tight-fitting clothing. Avoid sweet-smelling soaps, shampoos, and lotions in high-risk areas; remember, mosquitoes prefer to feed on flowers when not reproducing, so try not to smell like one! Dusk and dawn are the times of day when you are most likely to be bitten by an Aedes aegypti (the ones that transmit dengue fever) mosquito; cover yourself before enjoying that sunset cocktail! Along with being attracted to carbon dioxide breathed out by their prey, studies show mosquitoes are attracted to chemicals excreted in sweat. Staying as clean as possible — without smelling too flowery — will help to attract less mosquitoes. Staying clean also helps keep your travelmates happier! Reapply DEET to exposed skin at least every three hours for maximum effect. Apply more often if you are sweating a lot. If you need to use both DEET and sunscreen, apply the DEET first, allow it to dry, and then apply sunscreen. Products containing both are often not as effective. When first checking into your accommodation, spray holes found in window screens and nets with DEET. Turn over any buckets, empty flower pots, or other sources of stagnant water outside. "Bug zapper" lights aren't your friends! They don't kill many mosquitoes but actually do zap friendly insects that would have killed mosquitoes for you. If you have one, use the mosquito net above your bed. Tuck in corners to keep the net secured, and spray any holes you find with repellent. Burn mosquito coils — made from a powder derived from chrysanthemum plants — whenever sitting outside for prolonged periods. These coils are usually available from local shops. Don't use them inside; never burn coils inside enclosed spaces. Burning incense sticks will also offer some protection. Southeast Asia was declared by the WHO as the area with the greatest risk for contracting dengue fever. Instances of the virus are on the rise; dengue has spread from only nine countries to more than 100 countries in the last 40 years. Dengue fever even began making appearances in Florida in 2009 — the first cases seen in the U.S. in more than 70 years. Note: Singapore is an exception; most of the island is sprayed to control mosquito populations, and measures are taken to keep dengue in check. Dengue fever is transmitted by the A. aegypti species or "tiger" mosquitoes (with black and white stripes) that often bite during the daytime. But don't worry about every bite you receive on your trip. You can't get dengue fever unless bitten by a mosquito that is already carrying the virus. No one knows for sure how many people get dengue fever every year; cases often happen in rural places or go unreported. A conservative estimate is that at least 50 million people contract dengue from a mosquito bite each year, while some experts believe as many as 500 million people may become infected annually. Dengue is thought to cause around 20,000 deaths per year. Undoubtedly, many cases go undocumented in remote parts of Asia where medical treatment isn't accessible. Dengue fever takes around a week to incubate after you are bitten, then emerges in the form of a rash (similar to measles) followed by a fever and lack of energy. Victims react differently to the five types of dengue fever. Infected travelers report feeling ill for between one to four weeks, depending on the strain. Unfortunately, dengue fever isn't the only mosquito-borne threat in Asia. Outbreaks of Zika fever have been reported across Asia, particularly in India. A highly anticipated vaccine for dengue fever became commercially available in 2016, however, it is only partially effective. Even worse, people who were vaccinated displayed worse symptoms than usual if they still contracted dengue fever later. The vaccine appears to enhance the severity of dengue fever. At the moment, the manufacturer and WHO only recommend the vaccine for people who have previously had dengue fever. Dengue fever is also another good reason why you should get travel insurance before you leave home. DEET, developed by the U.S. Army, is short for N,N-Diethyl-meta-toluamide. Yes, the chemical is as harsh as it sounds. Although natural DEET alternatives such as citronella and essential oils are available, DEET unfortunately remains the most effective choice to avoid mosquito bites. Concentrations of up to 100 percent DEET can be purchased in the U.S., while Canada and many other countries have regulations preventing products above 30 percent. Interestingly, higher concentrations of DEET are no more effective for avoiding mosquito bites than lower concentrations. Products with higher concentrations simply last a little longer if you are sweating. Spraying excessive amounts of DEET onto skin does not increase protection, but doing so does increase your ingestion and absorption of the dangerous chemical. Reserve the high-concentration repellents for spraying items, not skin. The safest way to use DEET, as recommended by the Centers for Disease Control and Prevention, is to apply a repellent containing between 30 – 50 percent DEET every three hours. Many experts suggest opting for a lower concentration and reapplying more frequently. Never use DEET on your hands or face as it will inevitably end up in your eyes. Do not use DEET under clothing. Do not apply DEET on broken skin (including infected mosquito bites, cuts, scrapes, etc). During big adventures such as trekking in remote areas, travelers are often forced to wear both DEET and sunscreen. Always apply DEET first, then put sunscreen on after. DEET will reduce the effectiveness of sunscreen and cause you to burn in patches. Is Zika a Serious Threat in Asia? What Are the Symptoms of Zika?